The 2013 Northwest League champions Vancouver Canadians had an outstanding pitching staff. Not only did they get great results out of the gate from Thunder Bay native Eric Brown and Jeremy Gabryszwski, but when Brown and Colton Turner went up to Lansing (Turner returned fairly soon), reinforcements arrived in the forms of Shane Dawson and Tom Robson, a pair of Canadian pitchers who had been lighting the Appalachian League on fire. We’ll begin with our Pitcher of the Year, Kyle Anderson who led the team in starts (15), innings pitched (83) and strikeouts (58). Kyle is a 23-year-old, 6’2″ lefty who was signed as an undrafted free agent in 2012 by the Jays and spent most of last season with the C’s so he was repeating the level and really showed that he belonged in Vancouver. Anderson can’t really be seen as a prospect because of his age and mediocre stats in a number of categories, but he was definitely a workhorse and one of the cornerstones of the Vancouver starting staff. He finished up the season with a 2.71 ERA and a 1.04 WHIP with just 12 walks and the aforementioned 58 strikeouts. His FIP was 2.73 which means that luck didn’t really help or hurt him and his K% of 17.1 was a big improvement over last season but still isn’t at a level that you’d be able to see him really coming out and dominating in the higher minors. I do see Anderson getting the opportunity to pitch in Lansing next year. Jeremy Gabryszwski has one of the more difficult name to spell in the Blue Jays’ organization and he’s really a tale of two seasons. In the first half, he was dominant and induced a whole lot of ground balls while putting up control numbers with an ERA and WHIP to die for. He came back to earth in the second half but still posted a very solid season with a 2.82 ERA (2.63 FIP), a 1.06 WHIP, 10 walks and 40 strikeouts in 76 2/3 innings. While Gaby throws in the high-80s (occasionally hitting the low 90s), he really hasn’t shown the ability to strike a lot of batters out and his 12.9% K rate is very low, despite the 4:1 K/BB ratio. Gaby is still young (20) and there’s hope that he can sharpen up an out pitch. He’s also on the weighted ball program which might help him add some velocity. He’ll surely be in Lansing next year with little left to prove in Vancouver. Colton Turner, a 22-year-old 21st round draft pick in 2012 by the Blue Jays, got to spend a little time in Lansing this year but eventually returned to Vancouver despite not pitching badly there. Turner made 12 starts for the Canadians and threw 67 innings with a 2.96 ERA (3.62 FIP), a 1.09 ERA with 17 walks and 39 strikeouts. Obviously, this walk to strikeout ratio isn’t the best considering the 14.9% K rate. Turner also had some control issues in Lansing, walking 6 in 10 1/3 innings there (I have a theory that pitchers can’t get away with as much in the Midwest League where hitters appear to be much more disciplined). I would definitely see him in Lansing but maybe coming out of the bullpen next year. Eric Brown was the Opening Day starter for the Canadians and earned himself a promotion to Lansing where he threw 28 1/3 solid innings. In Vancouver, however, he was outstanding, with a 1.37 ERA, a 0.97 WHIP, 8 walks and 46 strikeouts in 52 2/3 innings. Brown is the first of the starting pitchers that we’ve seen so far with a respectable K rate, hitting 22.7% in Vancouver (with a miniscule 3.9% walk rate) although that number dropped considerably when he got to Lansing (12.3%). Brown doesn’t have fantastic stuff but has shown that he knows how to pitch and the 24 year old has developed three solid pitches. I can see him starting the year in Dunedin as a long-man out of the pen or even ending up in a Ben-White-esque role next year. Tom Robson, a Ladner, B.C. native and 6’4″ 20 year old, was a dominant starter all year that culminated in a terrific performance in the final game of the Northwest League Championships. I saw him pitch in Bluefield and he carried the same kind of success into his work in Vancouver. He obviously doesn’t shy away from big games or big situations and his stuff doesn’t rely on batters swinging and missing on close pitches out of the strike zone. The 2011 4th rounder pounded the strike zone with his heavy sinking fastball but has the off-speed stuff to strike out batters when they don’t hit early pitches into the ground. He posted a 4-1 ground out to air out ratio in Bluefield and a 3.17 GO/AO ratio in Vancouver. In his 38 1/3 innings in Vancouver, he had a 0.94 ERA (but a 2.55 FIP) and a 1.02 WHIP with 11 walks and 29 strikeouts. Add that to the 1.38 ERA (3.01 FIP), 0.77 WHIP, 5 walks and 18 strikeouts in 26 innings in Bluefield and you have one heck of a season for Robson. He’s a pitcher who’s going to need a good defense behind him and will probably have to be less aggressive in the strike zone as he pitches against better competition. I see him as part of a big piggy-backing system in Lansing in 2014 with some of his teammates from both Lansing and Bluefield. Alberta native Shane Dawson made the jump to Vancouver with Robson and was also dominating the Northwest League until an injury cut his season short. 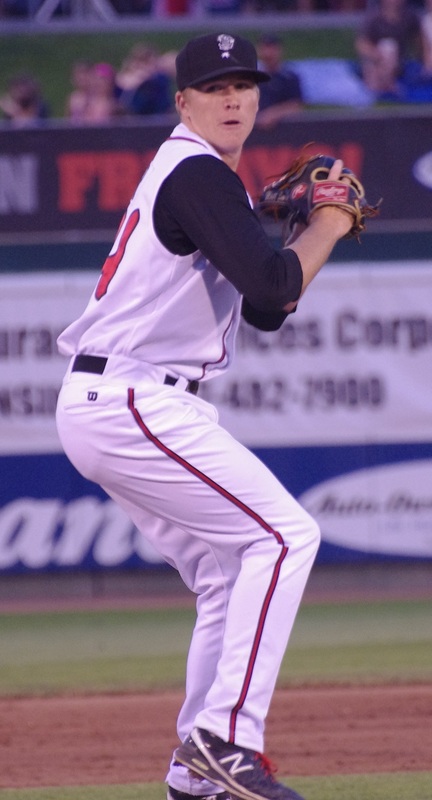 Overall, the 20 year old 17th round draft pick in 2012, pitched 46 innings with a 3.13 ERA, a 0.96 WHIP with 10 walks and 61 strikeouts between Bluefield and Vancouver. He was very successful in maintaining his high strikeout numbers and low walk numbers at both levels, keeping strikeouts above 33% and walks below 6%. Dawson isn’t the hardest throwing lefty but hides the ball well and has been able to be dominant. I can see him in Lansing next year if the Jays think that he can handle a bigger workload but he could return to Vancouver if the team wants to limit his innings a bit next year. Note: Follow the link for my scouting reports on Dawson and Robson. I took a look at Eric Brown and Colton Turner when I was in Lansing. Follow the link for a report on them. Note: All photos are copyright Blue Jays from Away (2013) and may not be used without permission.